A missing police pistol is connected to a series of recent heists and murders. Its owner WONG (Lee Kwok Lun) vanished earlier while pursuing a suspect in the mountains. His partner CHI-WAI (Lam Ka Tung) miraculously returned unharmed. 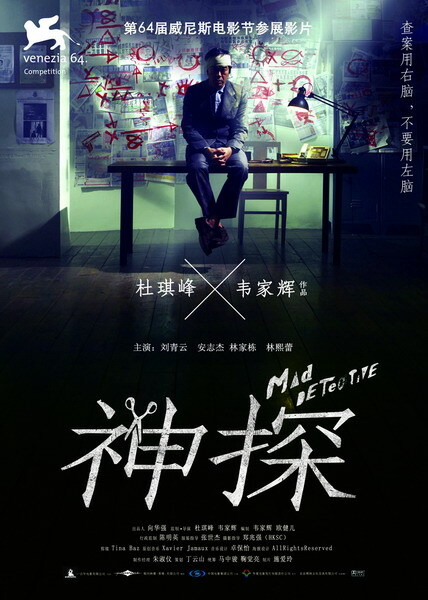 Hotshot Regional Crime Unit inspector HO (Andy On) is in charge of the serial murder investigation. He knows the only chance he has in cracking the case is to ask for help from his mentor/former boss BUN (Lau Ching Wan). Bun is recognized as a gifted criminal profiler until he went mad several years ago. At his superior’s farewell party, Bun sliced off his right ear and offered it as a present. Bun lives in seclusion with his beloved wife MAY (Kelly Lin) ever since. Bun has the gift to see into a person’s inner personality. This is where the subconscious desires, emotions and mental state are laid bare. For Bun, they are the key to unlocking a killer’s identity. But for Ho, Bun’s unorthodox approach has put doubt in his mind. Bun comes to conclusion Chi-wai has a total of seven personalities. The cop’s alternate identities are responsible for his murderous behavior. However, Ho feels betrayed when Bun’s investigation went beyond his imagination. Chi-wai’s lies have managed to penetrate and corrupt his vulnerable self.